The MBA/MS in Biotechnology degree exemplifies the advantage of a Johns Hopkins education—uncovering a deeper perspective through business and science. One of the first programs of its kind in the nation, the Johns Hopkins MBA/MS in Biotechnology program exposes students to a truly interdisciplinary approach to learning. Here, the fundamental and advanced principles of both business and biotechnology converge to provide a greater understanding of the economics driving this emerging technology. Coursework covers accounting, negotiation, finance, regulatory and legal matters, as well as biochemistry, biostatistics, and bioinformatics. With a perspective informed both by business and science, students work and learn in a team-oriented cohort. Offered in conjunction with the Johns Hopkins Zanvyl Krieger School of Arts and Sciences, the program equips them with the expertise and the confidence to become innovative managers in the biotechnology field. Graduates earn two Johns Hopkins degrees, mastering areas such as biochemistry, biostatistics, and bioinformatics while developing critical business skills in areas such as accounting, finance, negotiation, and regulatory and legal matters. Offered through the Krieger School of Arts and Sciences and the Carey Business School, the program allows you to earn two advanced degrees in less time than it takes to earn them separately. The program is specially designed to fit the schedules of working adults, following a curriculum sequence that allows you to complete both degrees in three years. View detailed MS in Biotechnology degree requirements here. For more information, contact the Advanced Academic Programs Admissions office at aapinfo@jhu.edu. Courses are offered online and at the Carey Business School’s Washington, D.C. or Baltimore campuses. Online sections of Business Communication, Leadership in Organizations, and Negotiation also require attendance at an in-person residency on the Baltimore campus. Students must take the following courses. All courses are 2 credits. *Biotechnology students who complete AS.410.645 Biostatistics may take an additional Carey Business Elective in place of BU.510.601 Statistical Analysis. Notify your academic advisor when you complete AS.410.645 so your record is updated accordingly. Students may complete 12 elective credits or 12 MBA concentration credits. Students planning to complete an MBA concentration should notify their MBA academic advisor. Contact your advisor or admissions office for details about concentration course lists and prerequisites. **The only concentrations currently offered online are: Health Care Management, Leading Orgs, and Financial Businesses. For a detailed curriculum overview, visit the Krieger School of Arts and Sciences program website. Tuition and fee information for the Krieger School of Arts & Sciences is available here. Applications for the MBA/MS in Biotechnology dual-degree program must be submitted to the Krieger School of Arts and Sciences Advanced Academic Programs. The admissions committees of both schools will review each application. To apply, visit the Advanced Academic Programs admissions page. For more information, call 202-452-1940 or email aapinfo@jhu.edu. Applications for the MBA/MS in Biotechnology dual-degree program must submitted to the Krieger School of Arts and Sciences Advanced Academic Programs. The admissions committees of both schools will review each application. 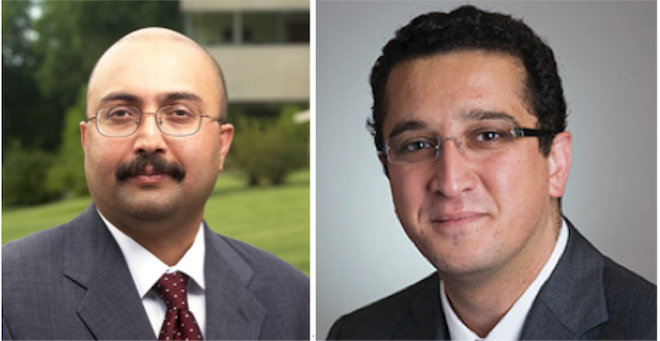 The Johns Hopkins Carey Business School is expanding the ranks of its tenured faculty with the appointments of scholars Goker Aydin and Sunil Kumar.